The mind of an upcoming Appalachian Trail thru hiker. 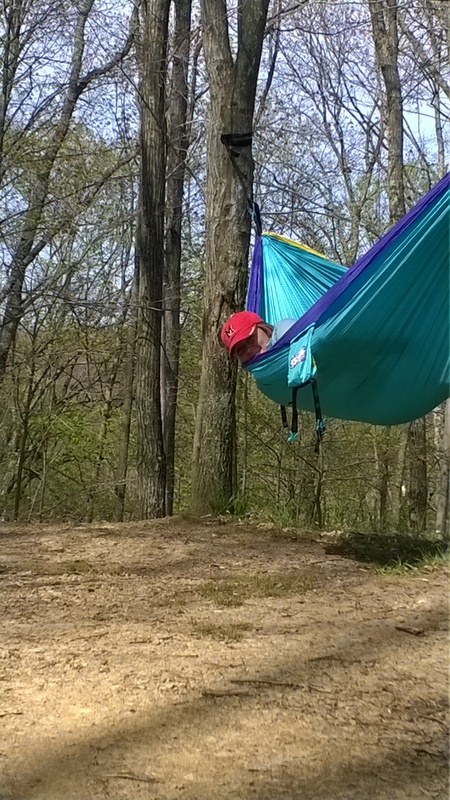 Off on another adventure this past weekend, this time at beautiful Zaleski State Forest in Southeastern Ohio. It has everything a nerd could ask for in a backpacking location: great trails, historic iron furnaces built into the hillside, a self guided naturalist trail, a haunted tunnel, great campsites, and a wicked cool tree plantation. 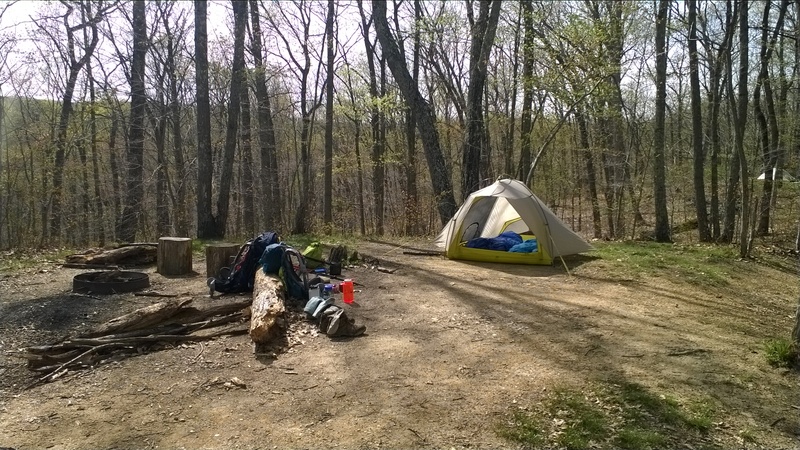 If you’ve read my blog before you know my last backpacking trip was to Shawnee State Forest and I was less than pleased with the backpacking trail conditions. I’ve never been to Zaleski before but it was like night and day. Ohio Division of Forestry must have realized how terrible Shawnee was and decided to actually try with Zaleski. 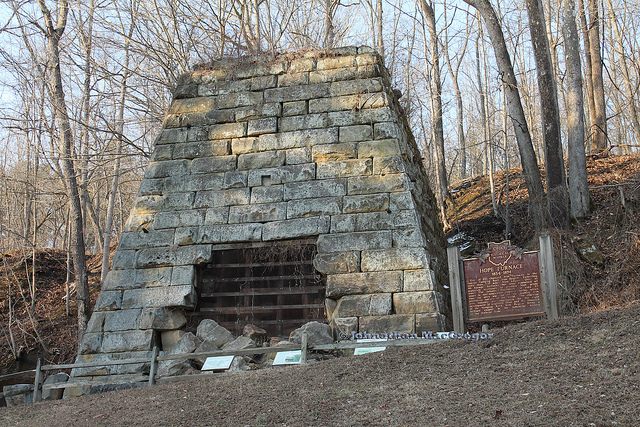 You pull into the backpacking trail parking lot and across the street sits the Hope Furnace; an old iron furnace from the mid 1800s when iron was being pumped out of Southeastern Ohio and wilderness preservation was a joke among the cancer stricken miners before they kicked the bucket at 28 years old. It’s just a cool thing to see before the real fun starts. Overall the backpacking trail were great. The difficulty wasn’t too high nor too low. There were good sections where you just traveled on a ridge top or in a valley for awhile but also getting some good up and down over distance. Since it was early spring all the dogwoods were blooming and so the color was beautiful. Wildflowers were starting to pop up but the trees had no leaved out yet so you could see the early color all the way down the valleys. There are three loops to this trail, totaling just over 24 miles. My girlfriend and I hiked them all in our three day, two night stay in the forest. We started on the south loop which was the easiest loop to hike and was a great way to start the trip. It was comfortable all the way to our first campsite, the second on the map, which was just over 6 miles from the parking lot. Got to the site early, chilled out, and watched all the other backpackers come in through the afternoon, evening and night. And when I say all, I mean ALL. Including us, there were 29 people in the site. It was like free burrito day at Chipotle. The site was the top of this entire ridge and it was a lot bigger than you could see from one point. Great stay at our first campsite though. Sammi just hanging out, literally. And our tent, which we have named the Puffer Fish. My tent is a single walled, Sierra Design ultralight. The next morning we set off and hiked the eastern half of the middle loop, up to the third campsite, which is also the beginning and end of the northern loop. We wanted to do the entire trail so we bypassed the campsite and hiked the north loop. You could tell the north loop was not heavily traveled. The edges were completely covered in multi flora rose and it’s really not that nice of an area until you reach the Doolittle Tree Plantation, which is a beautiful white pine forest. Great hiking through the tree plantation. I would have taken pictures if it wasn’t pouring down rain at the time. The last mile and a half of the north loop was the absolute pits though. Up steep hills that were completely rutted out by ATVs and trucks and completely muddy. The longest mile and a half of my life. Side note, my new Patagonia Torrentshell rain pants are killer awesome. Kept me dry, shed the water and were just great. 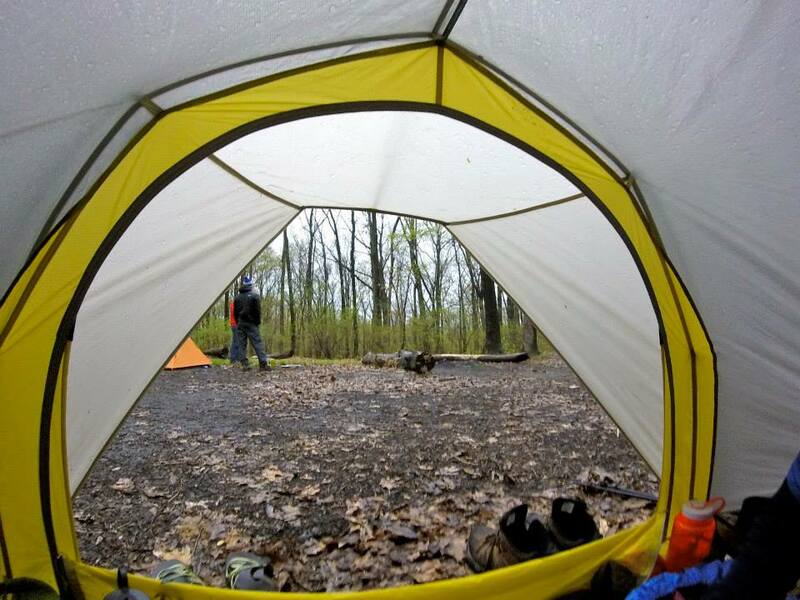 When we got back to the campsite after our rainy hike we were grateful to have a single walled tent. We were able to throw up the Puffer Fish in the rain and the inside of the tent stayed perfectly dry. Threw in our sleeping stuff, food and clothes and stowed the rest in the side vestibules. The rain kept coming for the next three hours and we stayed completely dry. Since my tent has a sort of awning in the front I was able to make dinner with the front door open and stay completely dry. Killer awesome. Our view for 3 hours. Getting to the chase…..the next day came and it was just over 6 miles back down the western side of the middle loop to the parking lot. It was a fairly easy hike. The trail hiked through this great wetland area at the end of the trail. It was beautiful. If the trail wasn’t so narrow and flooded in areas I would have been paying more attention to the birds and taking pictures. Overall it was a great trip. I would definitely go back to Zaleski State Forest. It was beautiful, great birds, great color, wasn’t completely ugly where they had recently logged (unlike Shawnee), great trails, and had some absolutely beautiful wetlands. I’m a bit of a romantic when it comes to wetlands. You might be wondering where a haunted tunnel comes into everything. 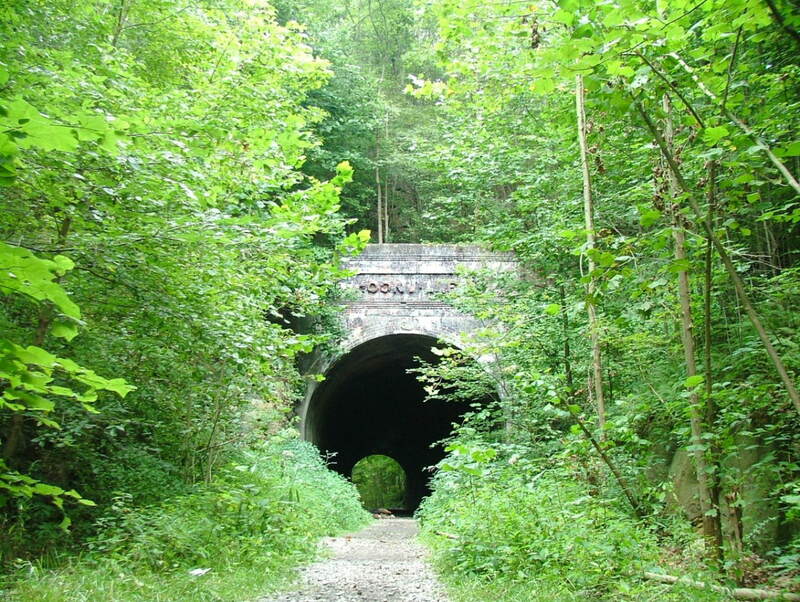 Well, the Moonville Tunnel is in the forest but not along the backpacking trail. It would be worth checking out another time, I just didn’t feel like searching for it once I got back to the car. I’ve researched it though and it seems pretty badass. Ghosts and everything. You should check it out. ← You don’t need any money on the AT, right?